Kids entertainment and How to keep them happy at the airport and during the flight? Travelling with family is definitely an enjoyable and exciting experience for everyone especially for the kids. kids entertainment is one of the tasks that parents have to be prepared when flying with kids. Children feel trapped in a seat and can not do the usual activities. Air travelling with the children can become dull if you are not prepared for it. Parents need to make sure to get the kids attention in order to make the flight more interesting and enjoyable. Kids entertainment is the key to success While you are on the way and everybody having trouble being patient. , When you flying with your young children sometimes looks like no one can wait and everyone is in rush to reach the Destination. However, It all relies on exactly how well-prepared you are for this. When you are travelling along with kids, there are many methods to make the trip more interesting for them. Usually, kids are more interested in group games and when everyone is involved. So always have ideas of group play along with each other. For example “eye spy” or scavenger hunts. Put these guidelines to use and enjoy the trip while seeing your kids enjoy theirs too. Let’s see how is possible to entertaining kids on flights and keep your children occupied and busy while you are travelling. Many basic things such as colouring books, white papers, pens or storybooks can help you to keep them occupied. To motivate your children to use these types of items, think about purchasing the special colour marker, or anything at all especially fun for every child. We understand that a number of moms and dads are more controlled and restrained for using electronic devices by their small children, However, travelling with a child on the plain is not easy. In order to keep toddlers busy, there is nothing compared to allowing your two year- old to enjoy watching a cartoon on a tablet. But make sure you prepared aeroplane car seat for your child. How to stay entertained on a long flight and what to provide for kids entertainment? Drinks help a lot! Drinks help the tiny ears on take-off and landing. If you have a plan for air travel along with baby it’s absolutely well worth using breastfeeding or using a bottle of milk on take-off and landing. This can help to prevent and stop their ears from flight pressure build-up. You can have considerably more than 100ml via security. The cabin crew can easily heat it up for you on the aeroplane. If your child is older, try out to providing them with a child drink instead. Snack Foodssnakes on a plane really are a must-have on any kind of trip. The travelling time will always be more fun with something to chew and munch on. Buy travel snacks that store nicely even without a fridge. Using the Sticker books To Get Ahead kids entertainment! Stickers are one of the best things to keep children entertained on a plane. They stick to everything and that’s just why they are so perfect choice to have them on the plain. Kids can play with them for hours.Don’t Just Sit There! Get some Books & Audio Books Ask your children to give you their favourite book list and find out which book they like to read. Alternatively, you can go to the local bookshop or library and pick some that you believe they would enjoy. Get several books with you on your trip. Consider the possible activities, from reading books, listening to music, watching cartoons and so on. This will certainly help them to forget they’re on a long flight. Audio storybooks are an additional choice to have some calm and quiet time out of your kids while you’re all on the plane.Travel-themed Colouring books are a fantastic timeout for you on your flight with kids! Bring along the basics such as cool colors books. Your kids will have plenty of time to produce and imagine, which will give them an outlet. To inspire your kids to use these supplies think about buying a brand new unique set of marker pens, or anything particularly fun for each kid. These books can help pass the time. if you’re concerned the littles have a pencil or pen in hands, have a look at Crayola Colour Wonder, which is mess-free books clouring. The special markers are designed just to work on the pages which are provided in the pack. If you want a comfy trip make sure to pack those books for your kids. Colouring books are great fun for kids entertainment and even there are available colouring books for teens and adults to join in. 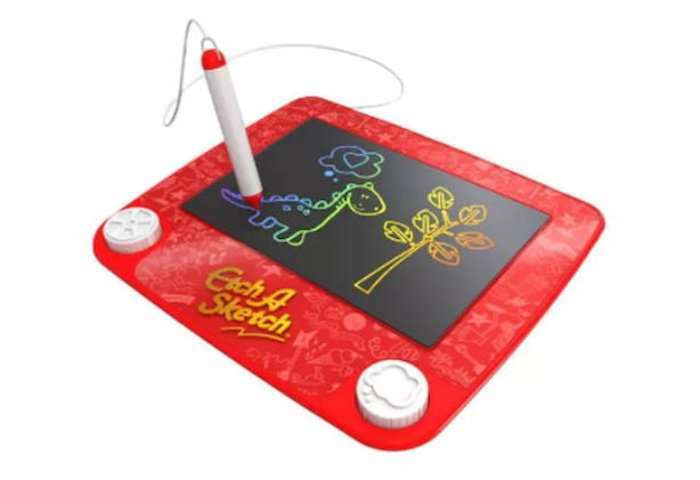 Play the magic screen or Etch-a-sketch Etching is an excellent idea for kids entertainment in order to keep them occupied. With this small size drawing tool, kids can create work of art and draw the masterpieces while you are having rest. And when they’re fed up of the masterpiece, you can wipe and begin all over again. To start over or erase, simply turn the Etch upside down, the draw will disappear. Therefore you can start over again!Why not Build and Develop Lego?For sure you can find some cool DIY Legos which is designed for travelling and it’s quite simple to do. Just look for the one which comes in carry-case – pack.how about “Who Am I “ or “What am I” the Game Questions or the Post-It This is another great ideas for Kids entertainment on a long flight. The game is a guessing group game and the players allowed to use “yes” or “no” response to answer questions to identify famous characters, country, animals and so on…This specific game works well with any number of players. But bigger group give more enjoyment and fun. Kids will love this game with family. additionally, when you play this game, there won’t be any kind of mess around your seats. The advantage of this game to work with is very few materials and also not much time for preparing, simply write the name of the famous character or country on the sticky notes. stick the card somewhere on your face and start the “who am I” game.Activity booksthese easy and basic colouring books are designed for kids aged 2 and above. Few cheap but New ToysPurchasing a few new toys for your trip is another fun things to do on a plane ride for the kids. just some cheap toys that children can play with whilst you are on the aeroplane. We say buy cheap and not the expensive ones because in case if the toys get lost or broken. Just don’t present and show them to the youngsters before the takeoff. They don’t have to be expensive.How about going crafty!using the time to be creative with your youngsters and the little ones, the crafts is really a topic that children are passionate about. kids enjoy while they are involved with exposed arts and crafts exercises and activities.Play travel gamesOne of the fun things to do on a long flight is the playing travel card games with your kids. Uno is recommended as one of the best games to play on airplane. The game generally is known as a fun cards game which everyone can easily play. Additionally useful for travel or flight delays! This usually rates highly among the best travel group games for kids. for instance Magnetic trip Board Game Set. The magnetic set includes a dozen fun board games. They include things like Checkers, Chess, Chinese checkers, Tic Tac Toe, Backgammon, Snakes and Ladders, Solitaire, NineMen’s Morris, and Loads of more classic games come in travel-friendly mini Pack. A small for kids entertainment.Use small DVD player or Download appsWhen you flying with kids don’t rely on the airline to supply any in-flight for the Kids entertainment. While you are flying with small children prepared yourself with a fully recharged and loaded tablet with some videos, movies and a few child-friendly games. You may also play games that you get turns of listing items that start with the alphabet, in order.Get some good games on your smartphone or download favourite games and put them on DVD and save them for those moments whenever you’re patiently waiting about in the airport. Buy brand new video game that will keep them busy for the long journey. Give him period limits to be able to give their eyes relaxation and a rest.Lets Design a postcard Put kids to work prior to your trip, and obtain them making postcards in order to post them on their holiday. You can provide them with a postcard template, as a sample. however, you have also a choice of buying a postcard book which will give you loads to select from.Travel Journal BooksIf your youngsters are old enough to write, provide them with each travel journal to complete the kids entertainment. Each kid can write about their unique holiday best parts. Check With the Airlinesome of the Airlines are usually interested in trying to keep the children pleased and quiet on aeroplanes. Check with the air travel to find out exactly what they might offer your children for in-flight Kids entertainment. Lufthansa provides kids little toys to enjoy and play with throughout the flight. Some other flight companies offer video screens for the kids entertainment. Previous articleAnother Great and Fantastic Day for London Marathon 2018!